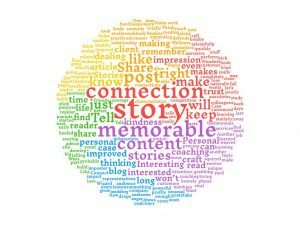 Think about the last memorable blog post, article or email you’ve read. What makes it memorable? It’s probably not some Interesting statistic or list of numbers (yeah, I fall asleep reading articles like that, too!) Attention-grabbing headlines might draw you in but they don’t keep you (or me!) on the page. Ash tells a story and weaves in the content she wants you to ‘get’. This makes it so memorable. When you’re a regular reader of her content, you get to know her through her storytelling. You feel like you’re a friend–a part of her life. And yep–this feeling leads to that triad we’ve all heard–people gotta know, like and trust you before they buy from you, right? Your job is to craft a narrative that draws your reader in and keeps her interested. Do it right, and she’ll share your content with her friends and colleagues, greatly expanding your reach. Do it poorly, and she might read your post or your email, but likely she’ll be gone in a matter of seconds. Chances are, she won’t buy from you, let alone even remember you or your message, because you won’t have made a connection. 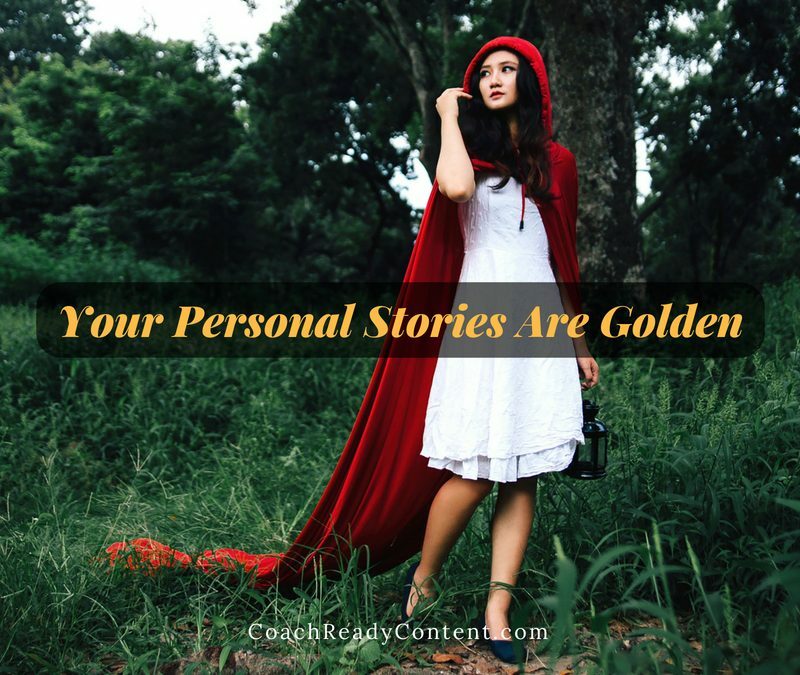 Whether it’s your original content or whether you’re customizing some purchased PLR/Done-For-You content, one of the best ways to build a relationship and grow your audience is to share your personal stories in your content. Tell your readers how you got started, what lessons you learned along the way, and how your life and business were improved because of these challenges. Personal anecdotes don’t even have to be business related to have an impact. Did you notice a kindness that someone did for a stranger and it totally inspired you to perform some random acts of kindness, too? Share the story. Did you learn how to treat customers better by dealing with your cell phone company? Tell your story about how your customer service has just been improved after that ordeal with their impersonal service representative The one when you wanted to pull your hair out. Another powerful story-telling technique is case studies. Tell your readers exactly what your coaching client did to lose 10 pounds before her daughter’s wedding, or how another client took your advice and was able to kick her sugar habit. Describe the before and after–that’s a story! These beefed up testimonials (because that’s all a case study is) will keep your readers interested in learning more from you. It helps your readers see that your services might just work for them, too! Want to really make an impression with your readers? Make unusual connections in your story. Talk about the squirrel in your yard that bravely defends his territory every time you take the dog out, and how it reminds you of your early days in business when you were convinced that competition was bad. Or you can use the characters from the Wizard of Oz as representatives of the characteristics that you help clients develop with your healthy lifestyle coaching–brains, courage, heart. By making a connection between completely unrelated topics, you can quickly craft a blog post or email that will get readers thinking. They’ll keep thinking about that for a long time as they process your unique connection. Don’t toss in a story just because you think you need a “hook.” You’ll know you’re doing this if you can’t easily transition from the story to the purpose of your post or email. If you find yourself saying something like “Ok, that’s enough personal stuff, now let’s get back to business,” you may want to rethink using that story. Your stories should naturally flow into business and your topic if you want to make a big impression. And trust me, when you get this right, you’ll suddenly find your posts going viral and your client numbers soaring. If you would like to use storytelling in your blog posts or emails, I’ve created a workbook to help you get organized and share your stories to connect with your readers. This resource is free and can be yours when you go here and request your copy today. You have stories all around you every day–tap into them and use them in your marketing. Stories are the secret-sauce to your success. Great post Melissa and I like your “Wizard of Oz” idea for the brains, courage and heart. Thank you so much, Glenda!! The Wizard of Oz has always been one of my favs! I love the idea of using unrelated stories in new and interesting ways,Melissa. That is a technique I haven’t tried yet. I’m inspired! Vatsala, let me know when you use this technique–I’d love to see your post!